Class Insecta, order Orthoptera, superfamily Tettigonioidea, family Tettigoniidae, subfamily Tettigoniinae, genus Tettigonia. Locusta viridissima Linnaeus, Tettigonia viridis cantatrix De Geer, Tettigonia flava Nedelkov, Tettigonia meridionalis Shugurov, Tettigonia paoli Capra, Tettigonia intermedia Jannone, Tettigonia trinacriae Jannone, Tettigonia longispina Ingrisch. Imago green, sometimes with brownish tint (body length 28.2-33.5 mm in male, 27.5-39.0 mm in female). Dorsum of head, pronotum and elytra with light-brown, sometimes indistinct, longitudinal stripe. Legs green; ventral spines on hind femora black, green at base. Length (mm) of pronotum 7.0-8.5 in male, 7.2-9.0 in female; elytra 40.0-47.5 in male, 44.0-53.5 in female; hind femur 22.3-28.0 in male, 25.3-29.5 in female; ovipositor 23.2-32.5. Fastigium of vertex 1.15-1.4 times narrower than 1st antennal segment. Tegmen coming far behind apex of hind femora, they 5.7-6.2 times longer than pronotum and 4.4-4.7 time longer than wide. Male cercus with large pointed inner tooth. Male subgenital plate widely emarginated posteriorly; female subgenital plate with narrow-triangular emargination, lateral carinae straight, complete. Ovipositor straight, 3.1-3.4 times longer than pronotum. Anterior branches of titillator smooth, with 2 apical teeth. Female lays eggs in the ground at a depth of 2 cm, one by on one, sticking them by 2-4 with each other; in total to 70-100 eggs. The species winters in ground in egg stage. Larvae appear in spring, developing 50-70 days, passing 5-7 instars. The larvae are green, with brown or blackish dorsal stripe, differing from imago in absence of wings. The species lives in Europe (except for the North), Northern Africa, Middle East, Afghanistan, Northern India, Mongolia, Western China. In the European part of the former USSR, it lives in middle strip and in the south; it has been occasionally marked in the Leningrad, Moscow, and Kirov Regions, being also distributed in the Caucasus, Kazakhstan, Central Asia, in the south of Western Siberia from Ural to Tomsk and Barnaul, reaching Mountain Altai in the East. Records from the more eastern regions belong to other species. Everywhere monovoltine. Adults meet since June till September, but since the end of July in the forest zone. Their chirring is heard during the whole day and till 2-3 a.m. Pairing lasts about 45 minutes. In 15 minutes, the male starts to chirr again. Female eats spermatophore to 15 hours. In deserts, the species prefers river valleys and edges of tugai forests. In Central Asia, it penetrates high into mountains, adhering to gorges with fresh grassy vegetation. Its habitats include riverside woodland, heath, brambles, box scrub, grassy margins of damp woodland, damp and semi-damp pasture, swath meadow, damp meadow, reed bed, rushes, cultivated land, riverside grassland, high marsh grassland and fallow and cereal field margin. In forest plantings, it meets in the lower part of crones more often. Lives above 15 m up to 1830 m above sea level. Omnivorous species being in the south of the European part the pest of field cultures, damaging wheat, barley, corn, millet, Italian millet, soya, alfalfa, various leguminous and gourd cultures, sunflower, sesame, poppy, tobacco, and buds of roses. The insects eat round leaves and eat away unripe grains and bolls. They prefers such garden cultures as peach, plum, walnut, and others, damaging buds, leaves, and ripe fruits. They damage leaves and young shoots on grapevine and a blackberry, leaves on oak and other deciduous trees. Sometimes they harm rather tangibly. The Bushcrickets damage more significantly in droughty years. Simultaneously they eat various small insects (flies, small caterpillars, etc.) and mites. 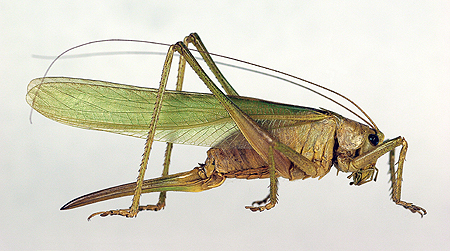 In cages the Bushcricket shows propensity to cannibalism, eating weaker individuals and larvae. Eating eggs of the Leptinotarsa decemlineata Say is registered. The species is not abundant in the northern part of its area. It is included in Red books of the Moscow, Vladimir Regions of Russia, and of other regions. Control measures include insecticide treatments during oviposition if necessary. Avet'yan A.S. 1952. The pests of fruit plants in Armenian SSR. Erevan: AN Arm.SSR. 183 p. (in Russian). Belikov V.V. 1950. Grasshoppers and Moroccan Locust in Georgian SSR. Byull. VNII instituta chaya i subtropicheskikh kul.tur 4: 136 (in Russian). Kryshtal. A.F. 1973. Tettigoniidae. In: Vasil.ev, V.P., ed. Pests of agricultural crops and forest plantations. V.1. Kiev: Urozhai, p. 174-177 (in Russian). Mishchenko L.L. 1949. Saltatoria (Orthoptera sens. str.). In: Pavlovskii E.N., ed. Harmful animals of Middle Asia (Reference book). Moscow & Leningrad: AN SSSR, p. 148-169 (in Russian). Shchegolev V.N., Znamenskii A.V., Bei-Bienko G.Ya. 1934. Insects, being harmful to field crops. Leningrad - Moscow: OGIZ - Sel'khozgiz, 464 p. (in Russian). Shelyuzhko L.A. 1932. The main pests of tobacco and the main measures of their control. Khar.kov & Kiev: NKSnab USSR, 52 p. (in Russian). Storozhenko S.Yu. 2004. Ornithoptera (Ensifera) of Asian part of Russia. Vladivostok: Dal.nauka, 280 p. (in Russian).